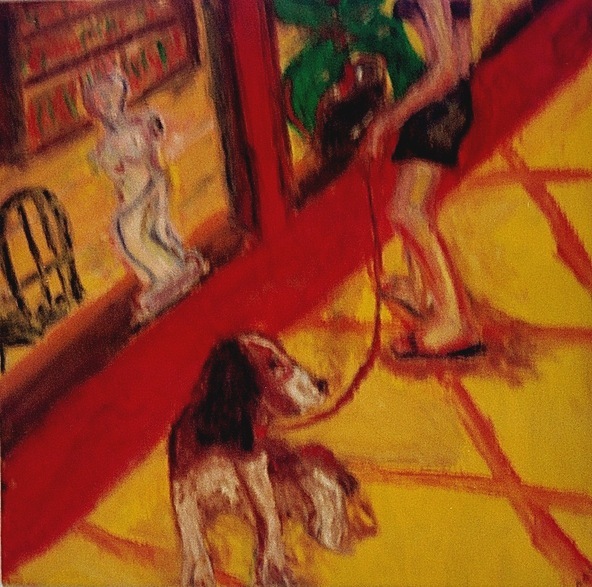 "Sitting and Shopping," 1996, oil on wood, 24"x24"
"You Are So Divine," 1996, oil on wood, 27"x24"
A few months after graduating from the Corcoran College of Art and Design I sold two of my paintings. The experience really rattled me. It wasn't so much that someone actually paid money for my paintings. It was because the works were so personal. One was essentially about the end of marriage, while the other was basically a portrait of my former wife with our dog and cat. The man who purchased them was also an older adult, divorced and a dog-owner. I realized that I had communicated with another person through colorful images, confirming for me what I had realized at the Corcoran about my mission as a painter -- to continue story telling, but through visual story telling. I had been a story teller most of my adult life as newspaper reporter and magazine writer and editor. I had written fiction as well, two unpublished novels and several published short stories. The root for all of the fiction, of course, was life, mine and the lives of others. Visually, in the study of art and in learning to make art, I had intuitively responded to early 20th Century painters and their bright, symbolic primary colors: Gabriele Munter, Edvard Munch, Pierre Bonnard, Ernst Kirchner, Max Beckmann, Henri Matisse and Pablo Picasso (especially his blue period). For me, they painted about what was in their lives and what they saw and knew. Visually, as I learned from the Germans, Munch and Bonnard, I also work for imbalance, in the odd perspectives, composition and seemingly crude drawing as a way to pull viewers in. 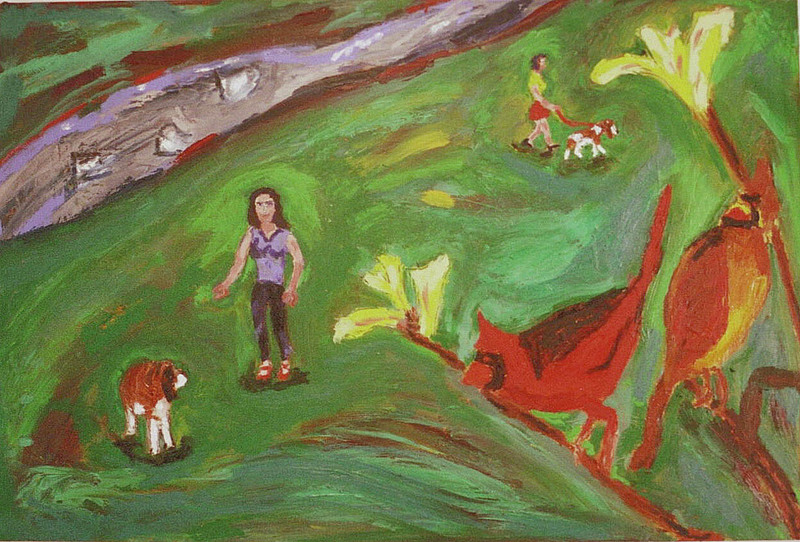 I had entered art school in my late 40s, about five years after I first started painting. Painting. Applying paint to a surface. There are those who consider painting, especially narrative, figurative painting, so retro, so out of it, so un-contemporary. Where are the digital images, the found objects, the massive constructions? As I say to some of my long-suffering friends who roll their eyes at yet another pathological painting about marriage, divorce and longing: So what? My paintings really serve more as elegies than as pathologies. Many are celebrations of a loving domesticity, even if the domesticity and love are nostalgic. As for the recurring dog, she is an art-historic symbol of domesticity, dependability and unconditional love. Some of the paintings are "fun," friends and their children playing in a park or farm scenes with horses, cows and pigs, while others are fantastical domestic scenes with an imaginary wife, child and pets. A line from a Bob Dylan song has the character singing that his future is in his past. For me, my future is my past (and sometimes present) and that is what I am communicating: emotions and celebrations of a life that now seem out of reach. Except in painting. As in serious fiction writing, where it is often best to write about what you know, the same applies to painting: paint about what you know, what you miss and what you desire. 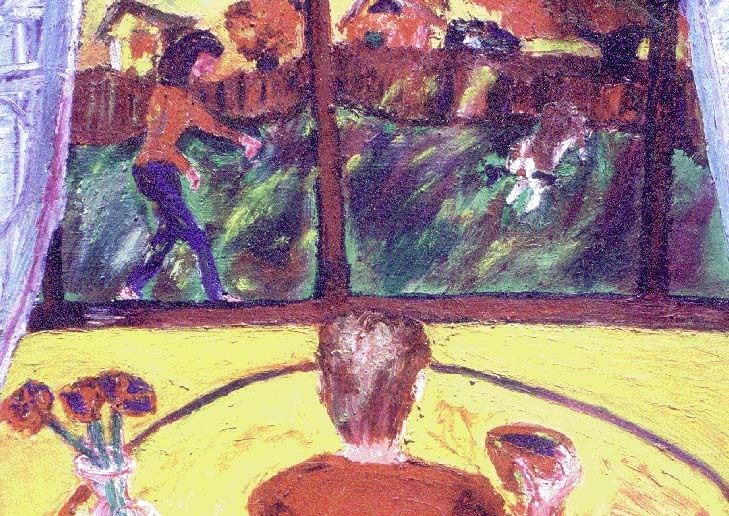 "At the Window," 1995, oil on wood, 24"x36"
Several years ago, when my wife was still with me, I was out running with our English springer spaniel at the time, Sophie, in Rock Creek Park. It was a brisk winter morning after a light snowfall and Sophie and I came upon a section aflutter with male cardinal birds. There must have been a dozen, their redness everywhere. With them, of course, were their mates. The image stayed with me, probably because I'm partial to cardinals anyway, but I became convinced later that the sight meant something. Was this my next life -- as a cardinal, with his mate, in the park, viewing some women from my past human life, walking their springer spaniels? Sure sounded like a painting to me. "The Next Life," 2002, oil on panel, 24" x 36"